In August, I, with my wife and another vegan colleague, went on holiday to Poland, staying in a hotel which cost £137 for full-board for the fortnight. Coach travel from London cost £100, but some people went by air or train. What an adventure! Vegetarianism is virtually unknown in Poland - and veganism is as difficult a concept to grasp for the Poles as differential calculus is to most teenagers. Coupled to that, we were in a country where almost no-one speaks English, and the native language is as different to all West European languages as Klingon. Hence, when we went to a restaurant for a meal, we were usually stuck with chips, beer and coffee - which were the only three appropriate words we knew in Polish. Fortunately, the holiday was organised by the international Esperanto network, so when we were with any of our Polish colleagues, they acted as interpreters. We had most of our meals in the hotel, and a Polish biologist on the next table, was our personal go-between with the kitchen staff. However, even with his help, the meals were often very strange - and if I ever see another dumpling, they'll have to carry me away in a straight-jacket. We never discovered why the vegans were the only ones never to be given lettuce - although everyone else had it. The carnivores often had potatoes, carrots and beetroot, but we only had these 2-3 times altogether. Sliced tomatoes and cucumber were served with almost every meal including breakfast. The soups were generally fine, and we were given some kind of tinned soya paste every day, which became very monotonous after the first few days. The Vegan Passport, produced by George Rodger, was useful, and we highly recommend it. We not only sent a photocopy of the page, in Polish, to the hotel before-hand, but we also used it occasionally in restaurants. Not everyone could be bothered to read it - or if they did, they couldn't understand the concepts. However, the one really good meal we had arrived after the head waiter sat down at a table and spent five minutes reading the page. Apart from mealtimes, our time in Poland was fun and interesting, and we intend to return next year - better prepared for the catering difficulties. There were about 75 people in our group - about 15 British, 30 or so Poles, and the others a mixture from Spain, Germany, Austria, Italy, Norway, France, Ireland, Denmark, etc. Apart from the British, very few could speak more than a few words of English, so Esperanto was the common language. There were daily lectures in Esperanto about diet and food almost entirely promoting vegetarian diets and warning against flesh-eating. We also had discussion groups, and in the evenings, we'd visit local bars or take part in the dancing at the hotel - often a very wild mixture of dances from different countries. All good fun! The professional guides who led the excursions to Prague and other places of interest, could only speak German, Russian and Polish, so again our Polish colleagues had to translate into Esperanto. If anyone needs an illustration that the adage 'Everyone speaks English' is rubbish, a visit to Poland will demonstrate it very clearly. The country is poor - with incomes less than a sixth of ours, and prices about half - but there seemed to be no shortage of goods for those who could afford them, and we would have no difficulty catering for ourselves. Next time, we will learn the names of some vegan foods and meals, but it helps to take along a Polish companion as even catching trains and buses is extremely difficult when you cannot read or pronounce names or ask for single or return tickets, or ask where to change trains, etc. It is all very well learning some Polish to order meals or ask for travel information, but what happens if you visit the neighbouring countries - as we did when visiting Prague in the Czech Republic? Fortunately, we can get by in Poland or any other country as we can use the Esperanto network to contact local people who are glad to help - and will often offer overnight accommodation. The number of vegans in the Esperanto movement is still small, but the proportion of vegetarians is high, and they are much more receptive to vegan concepts. Esperanto was developed as a language of peace and friendship - a language that is free from the unpleasant and threatening cultural, political and nationalistic associations of 'English', which is very much associated with MacDonald's and Coca Cola whose names you see everywhere. Esperanto works on a personal and practical level, and it is particularly appropriate for all those who want to foster an international movement of friendship, democracy and equality. It is about three years since I last wrote about Esperanto in Vegan Views. The Esperanto movement is in the same state as the vegan movement was 15 years or so ago, and it is now undergoing some radical changes - becoming more modern, youthful and realistic. The German youth movement is leading the way in Western Europe, although East Europe, China and some of the South American countries are already ten steps ahead. If any readers of Vegan Views tried Esperanto in the past and gave up, please give it another go now. We not only need more vegan contacts to spread the vegan message around the world - by correspondence, exchange visits, etc. - but the materials are much better now. Write or phone: Brian Burnett, Nant Yr Hafod Cottage, Llandegia, WREXHAM, LL11 3BG. Tel 01978 790442. Email: brianthesquirrel (a) compuserve.com. 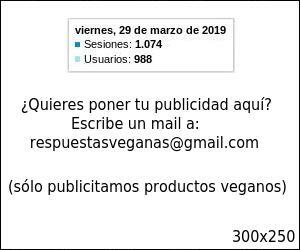 RespuestasVeganas.Org: La publicación de este artículo en RespuestasVeganas.Org no implica necesariamente que se compartan todas y cada una de las cuestiones expresadas en el mismo; sin embargo, consideramos interesante su publicación.